We are currently booked full for this training. Please consider our future sessions in 2019. Thank you! Group bus transportation from Liberia to resort and back is included for those arriving/departing with our group early Saturday April 6th and April 20th. Lodging complete with air conditioning, ceiling fans, in-room safes, study area. No refunds or transfers to a later session within 45 days of the session start date. Payments are non-refundable at this point in time. Travel to Daniel Oduber International (LIR) located in Liberia, Costa Rica on or before April 5, 2019 and spend the night. We recommend the Hilton Garden Inn in Liberia. Alternatively you can fly to Juan Santamaria Airport located in San Jose, Costa Rica by April 5, 2019 and spend the night. If you fly to San Jose, you will need to fly Sansa Airlines to Nosara Airport (NOB) on Saturday morning April 6, 2019, and taxi to Bodhi Tree; or book a dawn ground shuttle to Liberia on Caribe Shuttle (~4.5 hour ride). These additional travel expenses are an additional cost for you. Flying Home: Schedule your departure flight from LIR airport no earlier than Saturday April 20, 2019 at 12:00 pm noon. Alternatively you can book a taxi to Nosara airport and take a morning flight to SJO airport (30 minutes) to catch mid-day flights out of SJO. Booking your hotel the night before training: It is preferred that you stay at a hotel close to the Liberia airport. Group Transportation to Bodhi Tree Yoga Resort: The group bus will depart the Hilton Garden Inn in Liberia at 9:30 am for Nosara on Saturday April 6, 2019. Hilton Garden Inn is across the road from the airport. Group ground transportation is included in your cost. 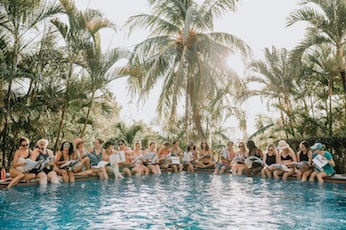 Departure from Bodhi Tree Yoga Resort: The group bus will depart at 7:30 am on Saturday, April 20, 2019. Group transportation is included in your cost.